APJEE Counselling 2017- अरुणाचल प्रदेश जेईई काउंसलिंग: Arunachal Pradesh State Council for Technical Education (APDHTE) is going to conduct APJEE Counselling for admission into degree and diploma courses. All the declaration of APJEE Result qualified candidates must further attend APJEE Counselling Schedule which is going to be conducted in the month of June 2017. Therefore candidates must go through a number of subsequent process at the time of counselling such as registration, choice filling, fee, seat allotment etc. The APJEE Counselling Procedure will be carried out in three rounds and thus in regards to more details, go through the article below. Arunachal Pradesh Joint Entrance Examination is conducted every year for admission into degree and diploma programmes. 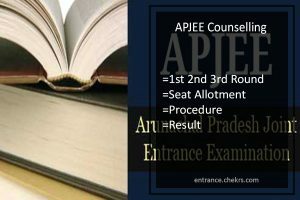 All the eligible candidates on the basis of APJEE Merit List will be called for APJEE Counselling 2017 through which applicants will be allocated their seat on the basis of choice, availability and merit. The APJEE Seat Allotment is conducted in three rounds. Apart from this candidates must report to the institute for document verification as per scheduled. Applicants must follow the below mentioned process at the time to APJEE Counselling. The preference of candidate will be taken into consideration depending upon the availability of seat as per merit on his/ her course stream. If any candidate does not want to pursue the course allotted to him/ her, then they must immediately surrender the seat whatever may be the condition. Arunachal Pradesh Government has the right to nominate eligible candidates if any situation arises. After allocation of seat to the candidates, he/she must report to the allotted institute for document verification purpose. Candidates must carry the original copies of the below mentioned set of documents along with one set of photocopy. APJEE Counselling will be conducted after the declaration of APJEE result. All the qualified candidates will be allocated seats through APJEE Seat Allotment process on the basis of choice, merit and availability. Once the allotment results are declared we will update you here with the same. For more updates stay tuned to our portal and in case of query place it in the below box.